In screw air compressor working the flow of air and oil has made the combined effect on the performance of the compressor. Compressed air can be obtained by various types of compressors out of that screw air compressors are widely used in the engineering sector. This air compressor type has different working principle than the reciprocating air compressor. So, the proper information on air and oil flow in screw air compressor makes you better maintenance engineer. The oil flow in screw air compressor works as a coolant, sealant, and lubricant also. Hence it is very important to take due care of compressor oil. Oil is circulated by the receiver air pressure to various parts of the compressor where it serves as a lubricant, coolant, and sealant. Cool oil is injected directly on to the rotors limiting the temperature rise of the air during compression and sealing the clearance between the rotor lobes, casing and end plates. In addition, oil is directed to the bearings and gears. The air, which is being compressed, mixes with the oil, which is introduced into the compression chambers and forms mist. This air and oil mixture then enters the receiver. The oil flow from the air-oil receiver to oil cooler through a by-pass thermostat which by-passes oil cooler up to 80-degree centigrade. The oil flow through a strainer, oil check valve, and then to an oil filter. A relief valve inside the filter opens to allow the oil to bypass the filter element if the filter becomes so clogged with dirt and seriously restrict the flow of oil. The cooled oil from the filter is then piped to oil inlet manifold. During the compression process, oil is injected through the lower gusset of the compressor casing. The oil not only absorbs the heat produced during the compression but also seals the gap between the rotors. After the passing the stationary edges, the discharge commences. The inner lobe space is reduced more and more until its volume is almost zero at the delivery end. And subsequently, escapes through the discharge port. This process is repeated in each following inter lobe space of the two rotors, and practically continuous and even the air flow is produced by the rapid succession of the various discharge phases. The air-oil mixture leaving the compression chamber through the air a discharge valve is directed to an air-oil receiver. Where most of the oil is separated from the air. 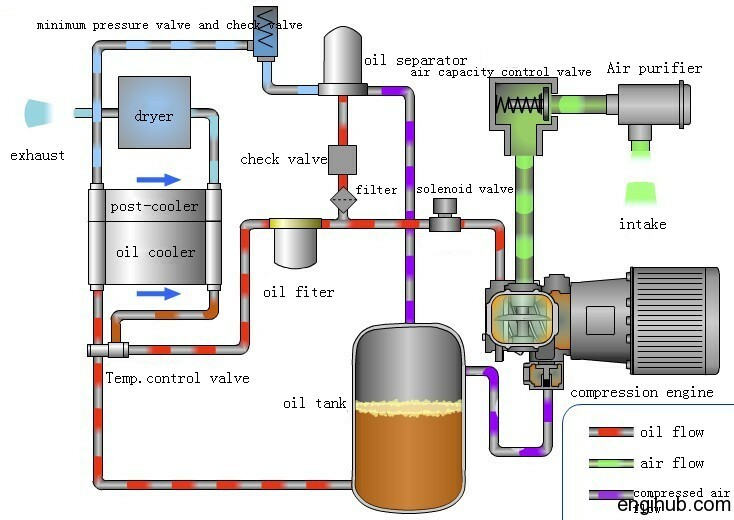 The air still containing oil passes from the air-oil receiver through an oil separator. Here the oil mist is removed and then it passes to outlet service valve through minimum pressure valve. The cycle is thus repeated. The air is drawn in by the compressor through a two-stage dry type air cleaner. Where the dirt particles are separated from the air by filter elements. The air then flows into the rotor casing from where it enters the inner lobe space of the rotors axially. The rotor rotates so that the inner lobe space opens progressively from an inlet to outlet. This phase corresponds to the suction stroke of a reciprocating air compressor. When the inter-lobe space is filled, it is isolated from the suction chamber by continued rotation. The volume of the inter-lobe space is reduced as meshing progresses from an inlet to outlet. The air cannot yet escape as long as the compression continues. And also until the tips and the flanks of the lobes have passed the stationary edges arranged at the discharge end of the rotor casing. This is all about how air and oil flow in screw air compressor, hope you like it.